Creating an XML sitemap helps search engines see all the pages available on your website, the frequency of updates and most important pages you have on your site. Although the XML sitemap does not improve your Search Engine ranking You’ve already installed a WordPress plugin to help you create XML sitemaps for your website and now you want to submit your XML sitemap to Google Webmaster Tools. Here is a tutorial on how to add a site, and submit your XML sitemap to Google Webmaster tools. As a prerequisite, please make sure you follow the steps here to first create your XML sitemap. Find Google Webmaster Tools in the Google search, create an account and sign in. Now that you have an account with Google Webmaster Tools, you can add a site to manage your sitemap and other aspects of our site. Google Webmaster tools not only allows you to submit your XML sitemap but will also notify you of crawl errors, traffic sources, keywords and more. 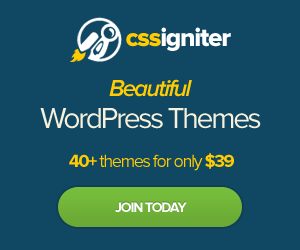 In this tutorial, first add a site. Enter your website URL that you want to submit an XML sitemap for. This step is slightly tricky. You will have to verify ownership of your website. There are numerous options you can choose to verify your ownership of your website. Google Webmaster Tools has opted for the recommended. But you can choose the alternate methods if you find them more easy to verify your ownership. 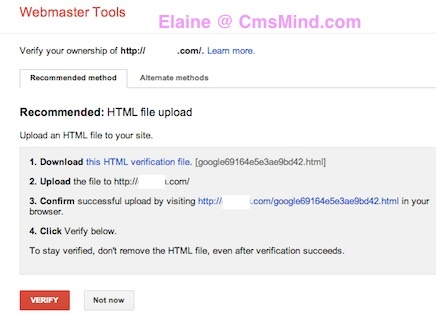 Follow steps in the Google Webmaster Tools to verify your website. Once you verify your ownership of you website, back in the Google Webmaster Tools screen, click on your site. Click on the ‘Sitemaps’ heading under your website in Google Webmaster Tools. Here you will submit your XML sitemap in Google Webmaster Tools. Submit your XML Sitemap to Google Webmaster Tools. This is the XML sitemap location that was specified in Step 6 in my previous tutorial on how to add a XML Sitemap to your Wordpress site. The tutorial is here. Usually your XML sitemap location is in your website.com/sitemap.xml. After you have your sitemap up for a day, you will see the stats of your sitemap slowly increase. There will be number of links submitted vs indexed into Google. Submitted means number of your website pages that were detected and indexed were the number of website pages that Google indexed into it’s search engine. 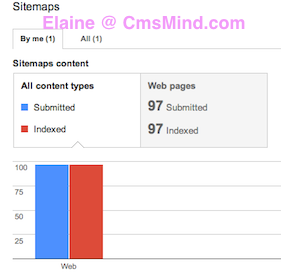 See my Google Webmaster Tools Sitemap stats (example). You can see these numbers increase over time. Most times the number of pages submitted is greater than the number of pages indexed.